A demonstration march in support of the Palestinian people and opposing the "state" of "Israel" began at Marble Arch and ended in Trafalgar Square, London. My very good friends, all of you; we are gathered today to express our sympathy with and our sorrow at the tragic plight of the Palestinian people, who have now been languishing under the heel of a harsh occupying power for nearly sixty years. Harsh, not just because of the horrific bloodshed, which in varying degrees has affected innocent people on both sides. Harsh, not only because of the deprivation of property, homes and livelihoods, but chiefly because they are prisoners in their own land. They have been deprived of their freedom and right of self-determination. The occupying power we are talking about is a state known as "Israel", the rogue state known as "Israel" which is the brainchild of the movement known as "Zionism", and the members of which are known as Zionists. 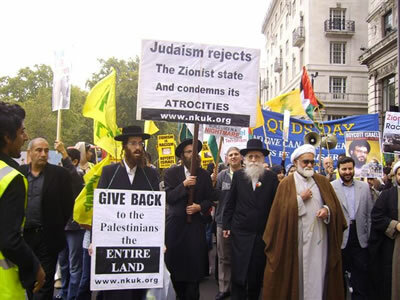 I'm sure you all know that Zionists are mainly people who were born as Jews but they have strayed from the path. 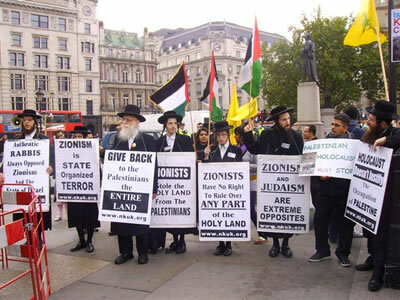 Their philosophy of Nationalistic Zionism has nothing to do with the age-old way of life of Judaism and they in no way can represent authentic Judaism. I'm here today under the banner of the group known as Neturei Karta who spread the vital message of the total and irreconcilable opposition of Orthodox Judaism to Zionism, both on religious belief grounds and on the grounds of Jewish religious humanitarian values.Â Our teaching and belief is that the Jewish people are destined to be dispersed around the world until the glory of the Almighty will be revealed to all.Â We are forbidden in the sternest of terms to try to change this by the efforts of our own hands. The state known as "Israel" flies completely in the face of this belief and that state has no right to exist. That is, as far as our religious belief is concerned. Perhaps more understandable to you is our absolute opposition to the fierce nationalistic sectarian philosophy in a land occupied by another people. A philosophy which must, by its very nature, be devoid of compassion and consideration for the yearnings of self-determination by that people in the country they have lived in for centuries. This again is totally against the teachings of compassion and consideration which have been handed down to us through the generations. 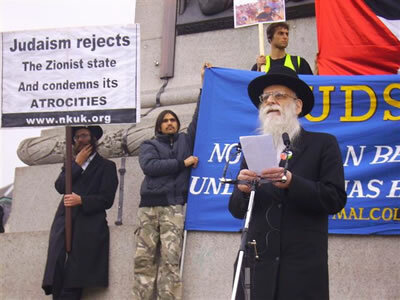 So, let me repeat, once again Zionism is not Judaism.Â Zionism in no way represents the true values of Jews and Judaism. We must remember that the root cause of strife in the Middle East is the very existence of the Zionist state. Very interesting, I was recently reading a report, and anyone can read it, in Hansard, which is the official report of the proceedings of the House of Lords and the House of Commons. I was reading a report of a debate that took place in June of 1922 on a motion that the British mandate as it was set up to help form the Zionist state in Palestine, was flawed, the whole idea was flawed. The motion was proposed by Lord Islington, and was supported by other speakers. Already eighty or ninety years ago they saw so keenly the problems that would arise out of Zionism. And you know that motion, that the mandate in the format it was, was flawed, was carried by a very large majority. But we have the constitution in this country that the House of Commons overrides the House of Lords, and the House of Commons overrode them. 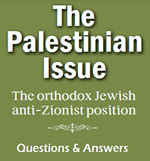 So, once again the underlying cause of strife in the Middle East is the very existence of the Zionist state, because of this and as our previous speaker said so clearly, we can only pray for an early, speedy and peaceful total dismantlement of the Zionist state of Israel, to be replaced by a regime entirely in accordance with the aspirations of the Palestinian people in which Jews, Muslims and Christians will be able to live side by side in harmony as they did for centuries in all the Arab lands before the advent of Zionism. My friends, may we very soon reach the time when all mankind will be at peace with each other and the glory of the Almighty will be revealed to all. Amen.